Last week, I played caterer to a very special guest. Apron tied on tight, prep bowls aplenty, and a glass of white wine to keep me cool under pressure, I served a three course meal that was light, bright, and of course, low in sodium. While my companion’s identity will remain anonymous – sorry, I’m keeping this one to myself – I will share with you the secrets that made this mid-afternoon feast an easy success. I went simple, choosing recipes that I could make the evening before, that required minimal attention, and that, well, honestly, had a lot of margin for error. I’ve spent too many dinner parties cooking intricate dishes, with multiple steps, that resulted in uneven temperatures, a kitchen full of mess, and a pooped-out hostess. I wanted this particular lunch to be effortless so that I could spend more time decorating my plates and entertaining my company. Because that’s the real fun of hosting a lunch. 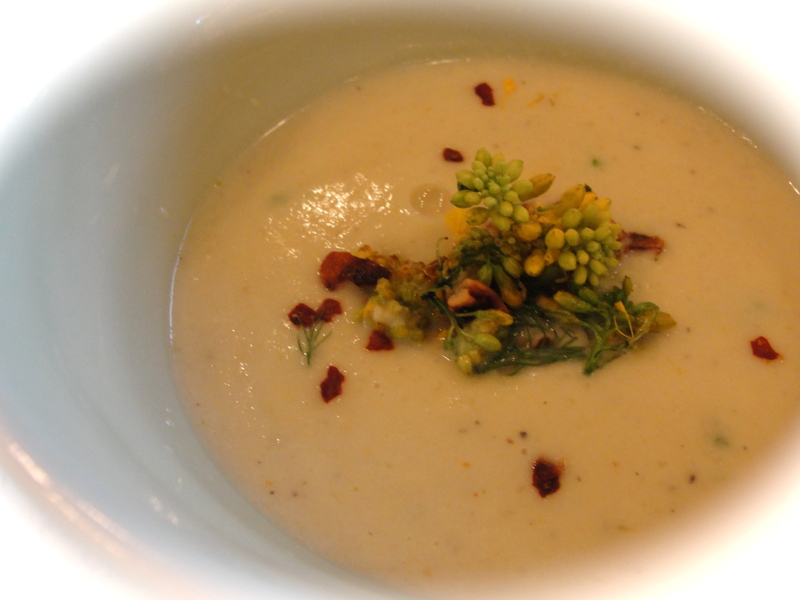 To start, I made a fennel corn chowder which I had prepared the evening before. The wonderful thing about soups, stews, and pasta sauces is that with every day they sit (within reason), the flavors become deeper and more pronounced. So when entertaining guests, making a soup is one of the smartest things you can do. Preparing it in advance will not only improve your recipe, but it may improve your day-of-party mood as well. I dressed up each bowl with fried garlic chips, a few dashes of crushed red pepper, freshly chopped chives, and some mustard flower blossoms. A little flair never hurts. Since the soup was a little garlic heavy, I wanted to follow this first course with something that had a perkier taste. 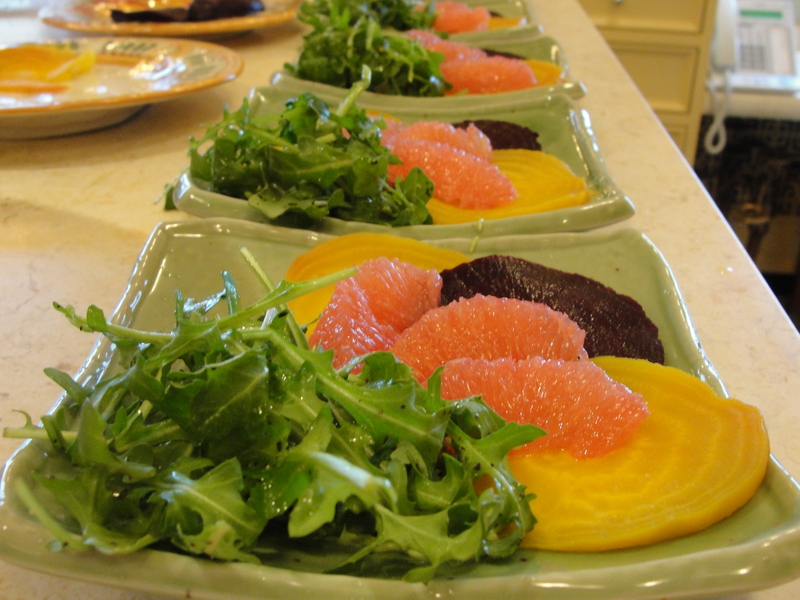 I decided to make a roasted beet and grapefruit salad with an avocado mousse vinaigrette. I personally am not a huge beet fan, but trust me, the combination of these three ingredients will make anyone a convert. The evening before lunch, I roasted five beets (three red, two golden of roughly even sizes) in the oven at 400 degrees for 1 ½ hours. BEET TRICK: To make roasting and cleaning the beets a snap, simply wrap each one individually in tin foil. Once they have cooked (and are soft to the touch, but not mushy), you can let them cool in their pouches and then use the tin foil to actually remove the outer layer of skin. I sliced the beets into very thin rounds, which you can do using a mandoline or with a knife and a very steady hand, and allowed them to keep cool in the refrigerator. To make the mousse, I combined one avocado with 2 tablespoons of olive oil, 1 tablespoon of champagne vinegar, and juice from half of a grapefruit. Blend and taste until it has the creamy zing you desire. You want it to be thick enough that it sticks to the plate, but not so heavy that it looses its dressing consistency. 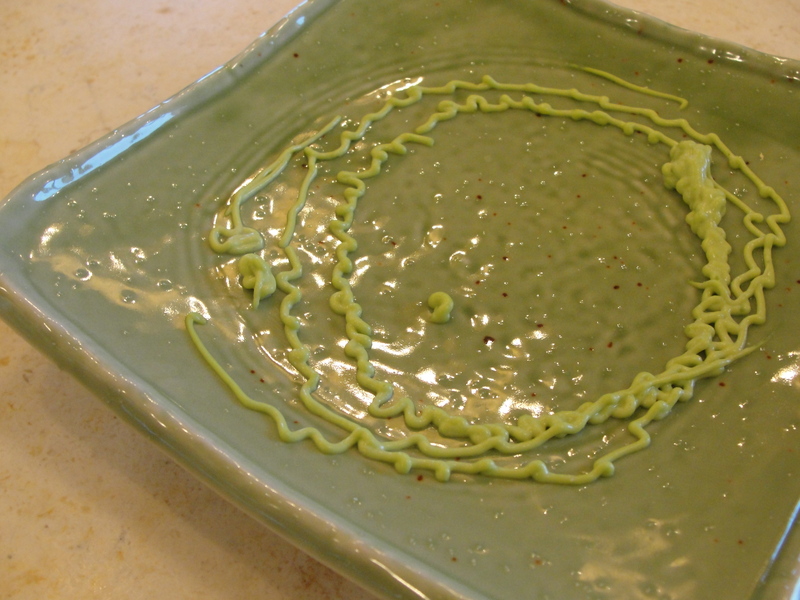 To plate like a professional, I put my avocado mousse in a little ketchup squeeze bottle and made circles on the base of the plate. This was my messiest version (my first squeeze attempt) and once I had gotten my nerves out, the rest of the plates had more even circles that didn’t look like a fifth grade art project. The most difficult part of this meal was supreming the grapefruit. But this technique can be made a million times easier if you have a very sharp fruit knife. It will make it much easier to slice the segments from the outer membranes and will result in crescents that retain both their shape and dignity. To plate the salad, I lightly dressed baby arugula in olive oil and pepper and plopped a handful in one corner. 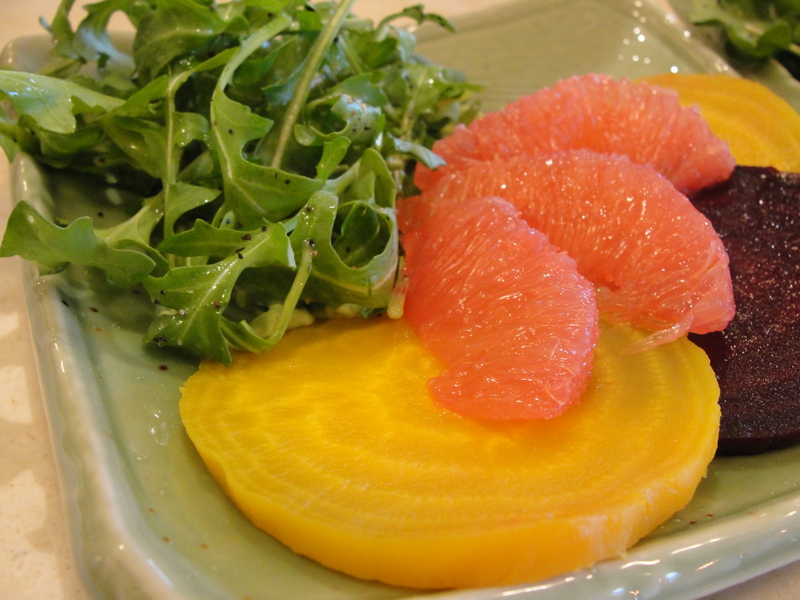 I then fanned three slices of beet, alternating colors, on the other side and topped with three slices of grapefruit. And that was it. Very simple and colorful, with a surprise avocado treat at the bottom. A real crowd pleaser that I would easily serve again. And to finish, I served up my new favorite dinner party dish – faux miso marinated cod. Dark, mysterious, and low sodium. It soaks in its marinade for two days and cooks under the broiler, uninterrupted, for twenty minutes. The fatty quality of the fish keeps it moist and makes it difficult to dry out. It is a great recipe when entertaining, because you know no matter what you do, you have a hit on your hands. But for the real details on this dish, you’ll just have to wait. In the meantime, chow on. I am sitting in my office salivating, thank you!! I don’t know what is more alluring the avocado mouse or the individually wrapping beets (to avoid the mass murder look when I normally cook them). Hi Lauren – love when people start salivating. The cod recipe will be coming your way tomorrow…so find a good time on Wednesday that you can drool on your desk without being caught by coworkers. I’m so glad you are enjoying the site and please feel free to make requests for recipes and advice! Just had to return to this post. I love the look of the salad. And so good to know how to “supreme” the grapefruit for reals!